Our started and trained dogs are sold by reservation only. They are trained to your specification. A $100.00 deposit will hold the pup untill he/she is 7 weeks of age. Final payment for the puppy is then due. Training will commence at 8 weeks of age. You will be billed on a monthly basis. The fee per month for the first four months is $550.00. Thereafter, training is $750.00 per month (28 days). a. coming and quartering to the whistle and voice. b. field work such as staunching on point, ranging close. c. retrieving on command, dropping the bird on command, and retrieving dead. 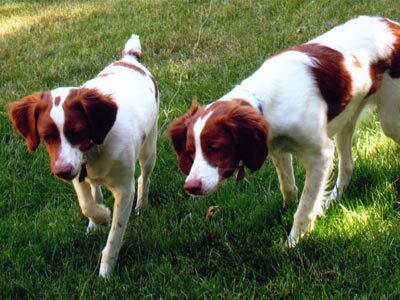 d. finishing, honoring another dogs point, handling in diverse habitat such as open fields, hedgerow, and woodlots. e. training exclusively on the gamebird that you will be hunting the most. You are invited to visit your pup regularly to personally see the progression of the training program. Pictures will be sent upon request. Our Brittanys are guaranteed healthy and will have all necessary vaccinations. We do require that all started or trained Britts be picked up in person. As a result, you personally see the dog work. All sales are final.